If you want to know the future of San Diego or any region for that matter, talk to someone in commercial real estate. Whether a company is looking to expand into the market or increase their local footprint, a commercial real estate firm is the first to know. As one of San Diego’s largest commercial real estate firms, CBRE is helping San Diego companies realize their innovative potential. 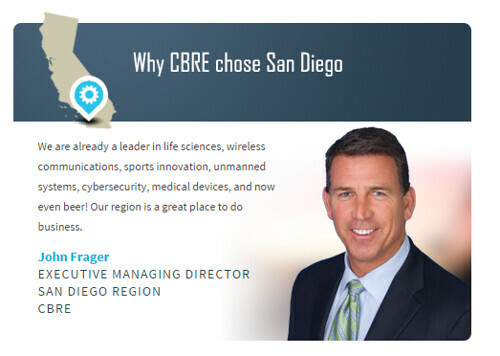 This week, we spoke to John Frager, executive managing director at CBRE San Diego, to learn more about how the firm helps local companies and the advantages of doing business in the San Diego market. 1) Tell us about CBRE. It’s an exciting time at CBRE as we invest in the platform and our people. For many other companies, their operating platform is seen as just a business expense; a requirement to keep the doors open and the lights on. At CBRE, our leadership has a different vision. Our platform is an offensive weapon, a resource that can give our professionals an advantage in the marketplace and help us consistently create great client outcomes. We’re investing to become world class in our research, technology, marketing, learning and development, and workplace strategies departments. We often downplay the importance of being the biggest firm in our industry. But our size, scale and profitability give us the capacity and the willingness to invest in our platform. CBRE’s capabilities extend broader and deeper than any other real estate services provider, offering unparalleled tools and resources, leverage, credibility, market coverage and local expertise. In a nutshell, San Diego has an innovative culture populated by a highly educated workforce with an unsurpassed quality of life. It is an ideal place to live and work! We are already a leader in life sciences, wireless communications, sports innovation, unmanned systems, cybersecurity, medical devices, and now even beer! I believe we will learn a lot from the Global Cities Initiative, a joint project from the Brookings Institution and JP Morgan Chase, to increase productivity, exports and foreign investment into our region. We are a gateway city to Asia with more direct flights. San Diego is also the gateway to our expanded Cali Baja Bi-National Mega-Region. Our region is a great place to do business. Illumina is a great anchor company, but we are equally excited about early stage companies like Edico Genome and BioSpyder Technologies. BioSpyder is an early stage molecular profiling company developing and marketing TempO-Seq for targeted expression profiling, a technology that will enable researchers to economically measure the presence and quantity of 1000’s of molecular target across millions of samples. Innovation like this will ultimately help companies like Craig Venter’s Human Longevity, Inc. pursue their specific missions more economically. Today, we are unquestionably the industry leader however we do not take this for granted and we continue to strive to truly be a world-class enterprise. We have an enviable client base, unparalleled service lines and a geographic footprint with the willingness and ability to invest in long term growth strategies. We transform real estate into a real advantage by putting our perspectives, scale and connections to work to deliver exceptional outcomes through real estate solutions that drive value and growth. We deliver advantage though perspective, scale and our connections. It is important to distinguish between client service and client outcomes. Providing excellent service to clients is a given – something they expect from any firm. We’re working to be a truly extraordinary firm, so we must deliver more than good service. We need to produce exceptional outcomes that create real advantages for our clients and help them to advance their own strategic agendas. San Diego’s economy will continue to strengthen. The CRE market is doing well, achieving levels not seen since before the recession and CBRE will continue to strive to be the market leader providing our clients world-class service.